Today Google Maps added live traffic coverage for 13 European countries: Austria, Belgium, Czech Republic, Denmark, Germany, Ireland, Israel, Luxembourg, Netherlands, Poland, Slovakia, Spain and Switzerland. 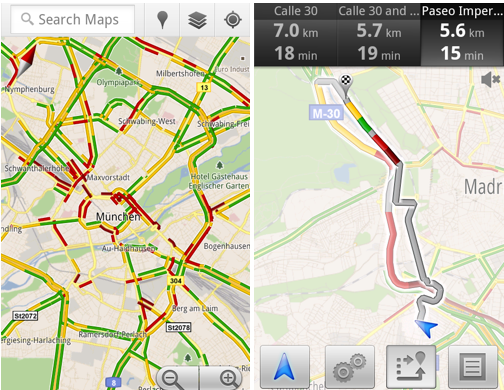 The new traffic information will automatically be available in Google Maps for Android, iOS, and mobile browsers. With the addition of live traffic data, users in these countries will now also be able to be routed around traffic in Google Maps Navigation (Beta) to save precious minutes when possible. wow, what a great news! pozdrowienia. How about Portugal? Second class citizens? Since when is Israel a European country? That's new, Israel is in Europe?! It's hillarious that live traffic coverage is available in Luxembourg but navigation through google maps is still not available in Luxembourg. "It's hillarious that live traffic coverage is available in Luxembourg but navigation through google maps is still not available in Luxembourg." The same goes for Israel. How can we use live traffic, if navigation is still not working? It's like handing you a car, without a steering wheel. What about Romania? When we'll receive support for trafic? what happend to sweden google. Why isn't Google giving ANY love to BLACKBERRY??? Mobile and Android Adoption Continues. Nice! people there got on average 2 high-end cellphones per person. and Israel isn't 3th world country. so They Are in "Europe Club"
Great news! but when will it be in latin America! what about Colombia? We love you Google! Super, when turnet on navigation for Poland? we should get the androids for all hacking jews!!! Israel in Europe?? Is Google map lost in translation? "Google Maps Navigation is not yet available in this location." So will this kill Israeli made WAZE? too bad, it is a great app! Para quando esta aplicação em Portugal, também? Great news. Unfortinately Google Maps Navigation is not yet available in Isreal. Any idea when will it happen? Hello,I hope you won't forget to add Romania..!..or is there a map already?..I got my Optimus One,a few days ago,and don't know how to use mavigation maps..if there is any.. ;) Thanks...! Good to note this. However, I am wondering if and when we can see India find a place in this list. This is simply amazing. We are waiting for this to rolled out in other parts of the world soon as well.